Heat a skillet over medium-low heat. Place two tortillas on a clean workspace. Top one tortilla with Monterey Jack cheese, sliced chicken, peanut satay sauce, sliced red peppers, and green onions. Place the second tortilla on top of the ingredients. Spray top of the tortilla lightly with nonstick olive oil cooking spray. Transfer quesadilla (sprayed side down) into preheated skillet. Cook for 1-3 minutes, or until golden brown. Spray top tortilla, then flip in skillet. Cook until golden brown. 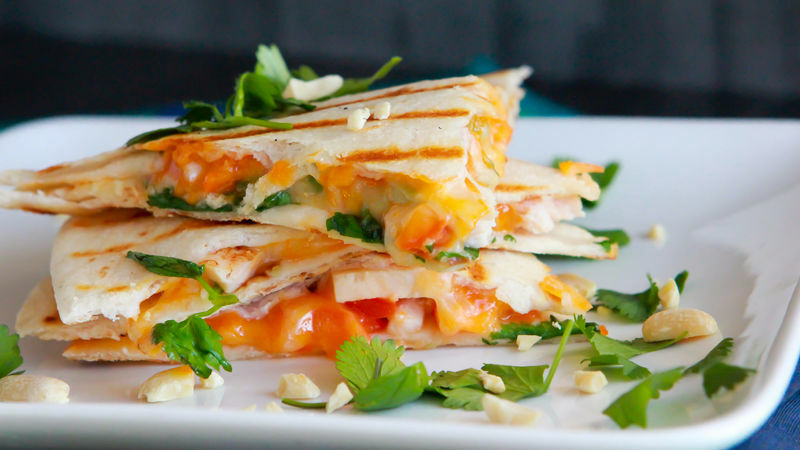 Make this breakfast even snappier by microwaving your quesadilla until the cheese is melted.